In a proposed change, attorneys representing families of those killed by police would be allowed to give summary statements, adding an element of debate to a process that has been seen by some as biased toward law enforcement. A King County committee is calling for significant changes in the way inquests into the police use of deadly force are conducted, including giving jurors the option of suggesting ways to prevent fatal confrontations. In an 89-page report, the six-member review committee recommended that county judges and prosecutors no longer oversee inquests and that they be replaced with hearing examiners and staff attorneys. Jurors also should be given the opportunity to hear summary statements from various attorneys, including those representing the families of those killed by police. The move would add an element of debate to a narrow process that has been seen by some as biased toward law enforcement. Inquests should continue to focus on fact-finding, but with a clear message that jurors should not affix fault on police or the person killed — a definition that has been somewhat lost in the process as people look for a verdict. 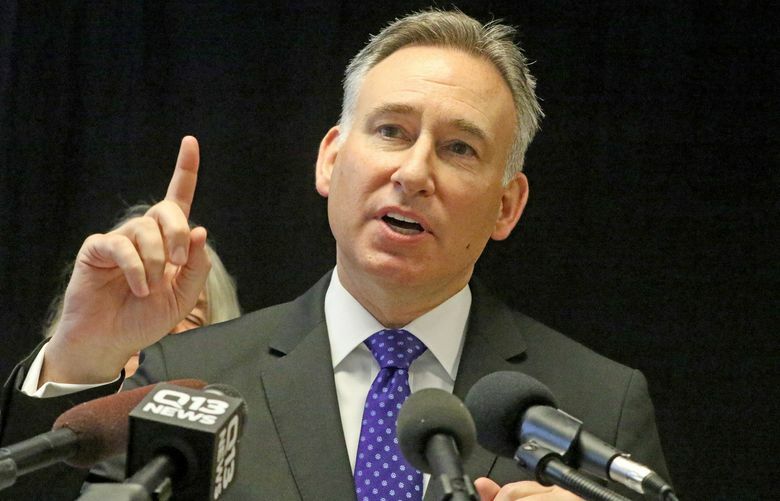 But inquests should not serve as a “passive consumer” of the underlying investigation into the death, but as “robust, probing and public review mechanism,” the committee said in a report submitted to King County Executive Dow Constantine over the weekend. Constantine, who formed the committee in December to examine how the county conducts inquests into shooting deaths and other fatalities at the hands of police, was to unveil the panel’s key proposals during his state of the county speech Monday morning. But the speech was canceled when demonstrators protesting construction of a new county youth jail disrupted the event. Constantine plans to review the report and seek public comment before making any changes to the inquest process. In January, several pending inquests were temporarily halted — and no new inquests were to be ordered — until the review committee completed its work. And, in the same month, the Metropolitan King County Council dealt with one issue when it unanimously adopted legislation to provide publicly funded legal representation during inquest proceedings to families of those killed — something police officers have been routinely provided. That issue was among the highest priorities for community leaders, and Constantine will be asked to provide clarification in any final action he takes, Guilmette said. The committee was headed by co-chairs Fabienne “Fay” Brooks, retired chief of the criminal-investigations division in the King County Sheriff’s Office, and Sandra “Sam” Pailca, assistant general counsel at Microsoft and the former civilian director of Seattle’s police internal-investigations agency, now called the Office of Police Accountability. The other members were Jeffrey Beaver, a Seattle attorney and member of the Washington State Supreme Court’s Minority and Justice Commission; King County Superior Court Judge Dean Lum; DeVitta Briscoe, sister of Che Taylor, who was fatally shot by two Seattle police officers in 2016; and Rick Williams, the brother of John T. Williams, a First Nations woodcarver whose fatal shooting in 2010 by a Seattle police officer that helped trigger wide-ranging, federally mandated reforms in the Seattle Police Department. Presently, district-court judges preside over inquests where prosecutors present information to a jury, typically six people, who answer a series of factual questions on the cause, manner and circumstances of a death. Although the proceeding has the trappings of a trial, jurors don’t determine criminal or civil liability. “It is little wonder that this led to widespread confusion,” the committee writes in making its recommendation that hearing examiners, drawn from a pool of temporary judges and attorneys, preside over inquests. Prosecutors could continue to use the results of inquests in determining whether criminal charges should be brought against a police officer — an extremely rare outcome. Staff attorneys should be provided to hearing examiners to help present information to the jury, which should be expanded to 12 members to enhance public participation and diversity, the committee says. Hearing examiners should have the discretion to allow opening statements by staff attorneys and attorneys for the parties, as long as they are consistent with fact-finding, not faultfinding, its report says. Jurors have previously only listened to testimony from law-enforcement officers and witnesses, who are questioned by prosecutors, attorneys for officers and, when they could afford it before the council acted, lawyers hired by the families. Closing statements to “contextualize testimony” should also be allowed, the report says. The committee notes that one “source of frustration” is that the process has evolved into “overly narrow, often rigid view” on the scope of the inquiry. While emphasizing fault should not be considered, the inquest is an appropriate forum for the community — through the jury — to consider issues and express its views on the “important question” of how deaths in similar circumstances might be prevented, the report says. “At the discretion of the hearing examiner, on a case by case basis, the scope of the inquest may be expanded to address this essential issue,” the committee writes. When applicable, jurors, for example, could make observations about the potential use of less-lethal options, actions or inaction by police that might have contributed to the outcome and whether bias was a factor, their report says. As a result, jurors could issue nonbinding recommendations regarding existing law, policy, procedure or training. The committee, which met with various groups, notes that community members viewed the narrow scope as too constraining, precluding consideration of relevant information. At the same time, according to the committee, the law-enforcement community saw the limited scope as positive because it focused solely on the incident under review. The committee also recommended the county take steps to improve the transparency of the inquest process, including through publication of schedules, recording and livestreaming of proceedings and distribution of results and trends. The county should strive to hold inquests within 90 days of a death, and use the results of multiple inquests to identify trends, the report says. Jeff Campiche, who is representing the family of Tommy Le in the 20-year-old’s shooting death by a King County sheriff’s deputy last year, said the committee’s recommended changes do not go far enough. “Without the family’s attorney’s right to present expert testimony such as a pathologist, police procedures or crime scene expert, the police agency provides the Inquest Jury with the only explanation of the homicide,” Campiche said in a statement. “How could the committee possibly consider this a full and fair inquest or expect a just result? Kevin Stuckey, president of the Seattle Police Officers’ Guild, could not be reached for comment.